The Division of Quality Assurance under the Wisconsin Department of Health manages certified nursing assistant programs within the state. Approved nursing programs must facilitate a minimum 120 hours to cover all the requirements for certification. State-recognized programs include those offered at community colleges, technical institutes, vocational schools, the Red Cross, hospitals and long-term care facilities. CNA candidates must undergo health screening and pass a criminal background check before enrolling in most programs. Although the average cost of training within the state is $1,000, there are free training opportunities as well as instances where financial aid can cover the cost. Check out the list of CNA training classes below. The three-week CNA training class offered at MCFI’s main campus includes classroom and clinical training. For the clinical component, students work with the disabled, special needs children and seniors. The day-only classes run Monday to Friday from 8.00 to 4:30 for 3 weeks. Students must attend all classes and cannot graduate unless they complete the full 120 hours of training – this is according to state regulations. MCFI follows strict admission policies to save students time and money. Each applicant must fill out the school’s application along with the background check disclosure form. Applicants must pass a background check in order to enroll in the training. In addition to the $20 application fee, students must pay $950 for tuition, which includes textbook, a uniform and gait belt. Additional costs include a $125 state exam fee and costs for a physical exam and TB test. The Nursing Assistant Diploma at Milwaukee Area Technical College is a 3-credit program, which prepares students for employment as an entry-level CNA. The training emphasizes basic nursing skills and procedures required to assist patients or residents at a hospital or long-term healthcare facility. MATC is one of the few schools in the area that offers a bilingual (Spanish) option for students whose first language in not English. The entire course curriculum and instruction prepares students for the National Nurse Aide Assessment Program (NNAAP). Graduates are eligible to sit the state exam. Tuition is $420.93 and does not include the cost of the textbook, supplies, medical exam, TB test and background check. Students are responsible for the $118 nurse aid exam fee. The CNA training at J.Johnson Education Center is designed to help students prepare for and pass the State of Wisconsin nurse aide certification exam. The coursework covers infection control, basic restorative services, patients’ right, communication skills, emergency and safety procedures, HIPPA laws, cognitive dementias/impairment education, interpersonal skills, and personal care skill in 88 hours of lectures and 32 hours of clinical experience. Graduates are eligible to take the state exam and provide exceptional care as CNAs after certification. Students must provide TB test, criminal background check, and proof of a flu shot at the time of application. Contact the school for information on tuition and class schedules. QHO provides an adult learning environment for students enrolled in the CNA training program. Small class sizes ensure individualized instruction. Committed instructors provide didactic and practical training in the classroom, lab, and clinical site using lectures, videos, and demonstrations. The curriculum covers 120 hours of instruction, including 32 hours in a clinical facility. Course topics include positioning, range of motion, feeding with special tools, fire procedures, patient confidentiality, patient rights, infection control, body systems, and vital signs. Graduates are scheduled for the NNAAP Competency Exam administered by the American Red Cross. The exam will be administered in a familiar environment at QHO’s facility. With a consistent pass rate of 98 to 99%, students are assured success. Applicants must pass a math and reading comprehension admission test, demonstrate good communication skills, and pass a TB test/ chest x-ray. A completed physical exam form and criminal background clearance are some other eligibility requirements. Registration must be completed in person. At the time of registration, the applicant must present a photo ID, social security care, and payment. Morning, evening and weekend schedules are available. Students enrolled in Paramount’s nurse aide program can complete the training in just 4 weeks. The curriculum facilitates laboratory training from the first week of classes, giving students the opportunity to develop strong clinical skills. Instructors, who are experienced in allied health, cover topics like vital signs, infection control, range of motion, patient hygiene, patient rights, safety and emergency procedures, and personal care skills in the classroom and simulated lab. Small class sizes allow of one-on-one instruction when needed. Prospective students can choose from a variety of class schedules designed to accommodate personal commitments or work schedules. Classes fill up quickly, so it is important to register early. A valid government driver’s license or ID, social security card, and 50% deposit of the tuition must be presented at registration. Job placement assistance is available upon completion. The 120-hour Nursing Assistant program at WCTC helps students develop the proficiency in the fundamentals of nursing. Instructors use lectures, skills lab, and supervised patient care experiences at a long-term care facility to prepare students for success on the NNAAP exam and on the job. The training also lays the foundation for entry into the Nursing Associate Degree Program. Students must be at least 16 years old by the first day of class. Prospective students must read the Nursing Assistant Functional Ability Criteria, set up a WCTC account to register for the program, schedule and take the compass reading test, complete the application and submit the fee of $20, complete the health requirements (TB test and flu shot), and purchase books and scrubs for the program. All classes are mandatory and students must be on time for all sessions. Tuition for the 3-credit program is $391. The cost does not include fees, books, and clinical supplies. Job Corps Centers offer free career training for persons 16 to 24 years of age. The completion time for the Certified Nurse Assistant program is 8 to 12 months. Students learn how to care for patients and assist with the activities of daily living, control infections through handwashing and other activities, follow safety and emergency procedures to assure patient safety, care for patients with Alzheimer’s disease and dementia, and how to perform basic nursing activities and record vital signs. Graduates are eligible to sit the state written exam and skills evaluation for certification as a nurse aide. 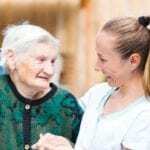 They will qualify for entry-level positions in hospitals, long-term care facilities, and nursing homes where they will assist patients of all ages with day-to-day tasks. Applicants must complete a criminal background check, commit to completing the required program hours in accordance with federal guidelines, complete the course curriculum which includes theory and practical training, obtain passing scores on the written and performance tests, and have a high school or GED. There is no cost to students and their families. Job Corps will cover the cost of tuition, fees, uniform, books, nursing supplies, and transport to the clinical sites. St Martin’s CNA program equips student with the knowledge and technical skills to succeed on the state certification exam for Nurse Aides and assume entry-level positions in an acute or long-term care facility. Students learn how to bathe and dress patients, serve meals and feed patients, record vital signs, turn or reposition patients, answer call lights, update patient charts, observe patients for responses to treatment plans, provide physical and emotional support, and maintain a safe and clean environment. Course topics include anatomy and physiology, medical terminology, infection control, range of motion exercises, personal care, safety and emergency procedures, Alzheimer’s care, vital signs, law and ethics, communication and interpersonal relationships, basic nursing skills, and the role and responsibility of a nurse aide. In addition to classroom lectures and demonstrations, students will have opportunities to build skills through hands-on practice in a mock lab and supervised clinical experiences in a long-term care facility. Applicants must consent to a criminal background check and drug screen, complete the health requirements, and attend all the program’s hours to graduate. Tuition costs $1,000 and includes the program’s textbook and lab supplies.